On Monday, the one hundredth anniversary of the outbreak of the First World War, Emi, Maxi and I decided to go to the Tower of London to see the Blood Swept Lands and Seas of Red art installation that has been commissioned to mark the centenary. It seemed like a simple, fitting thing to do so that Emi (age 8) might have some better understanding of what a momentous occasion it was. We've talked about the war a lot over the past few weeks, but I wanted him to do something that actually marked the day out as a reference point that he can look back to in the future: a sort of what-I-was-doing-when kind of thing. 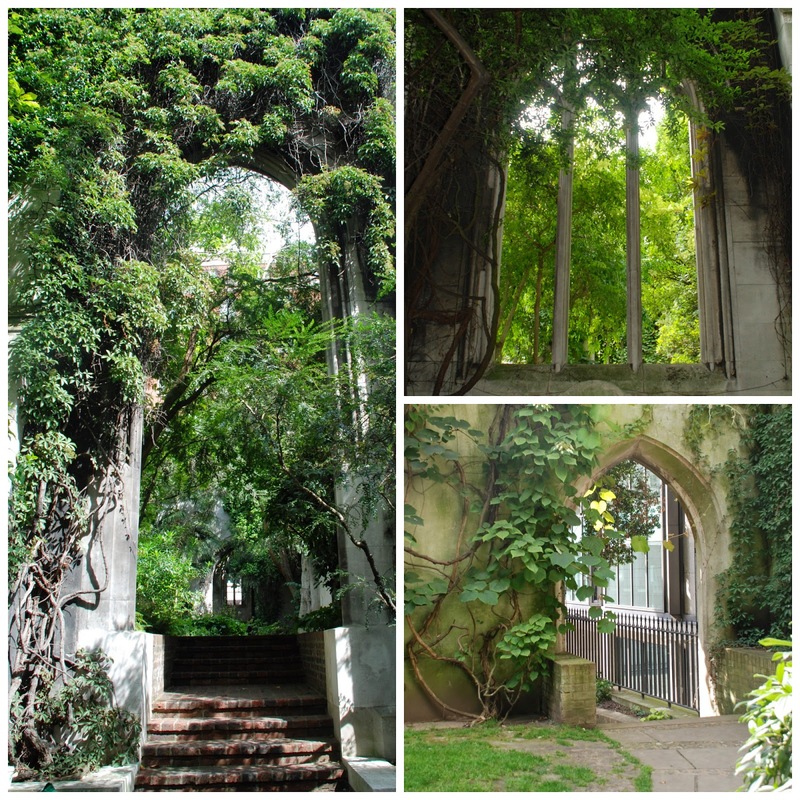 We like going for walks around London, so I fixed upon a route that would include the Tower and some of the amazing history that lies around about. 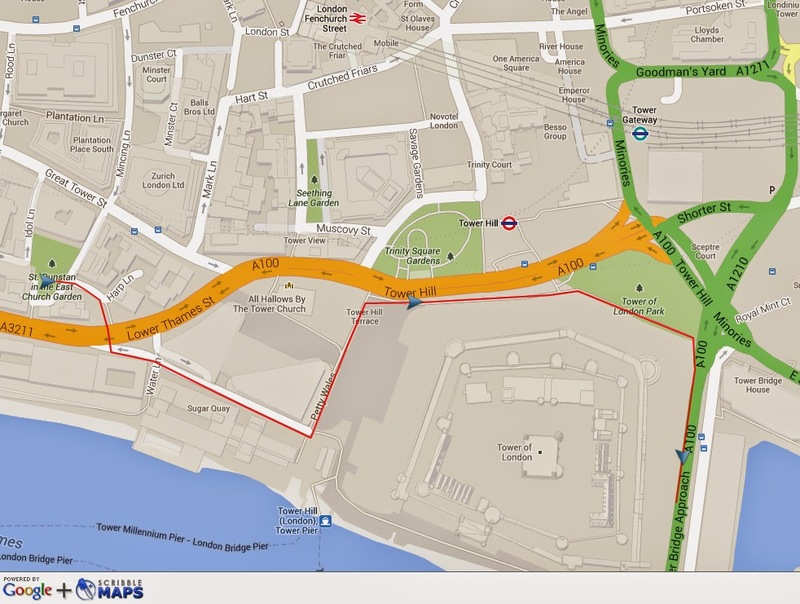 My route makes for an easy little walk of just under a couple of miles; it starts off at the Monument, carries on around the moat of the Tower, goes over Tower Bridge before passing by HMS Belfast, the Shard, Southwark Cathedral, the Golden Hinde II, Winchester Palace and ending at the Clink Museum. It's a perfect lazy morning stroll to work up an appetite before stopping off for lunch in Borough Market, one of my favourite spots in London, and somewhere where a lot of my walks tend to finish (ahem!). 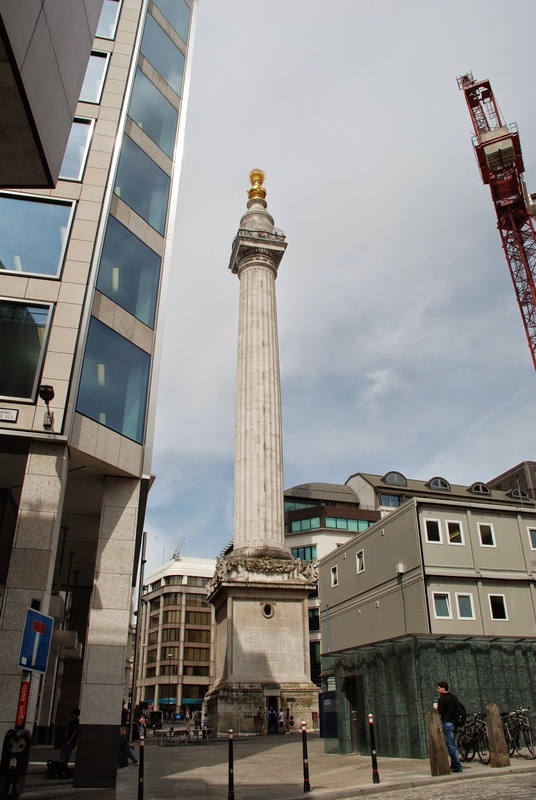 We started at Monument Tube Station, and then swung past the Monument itself. 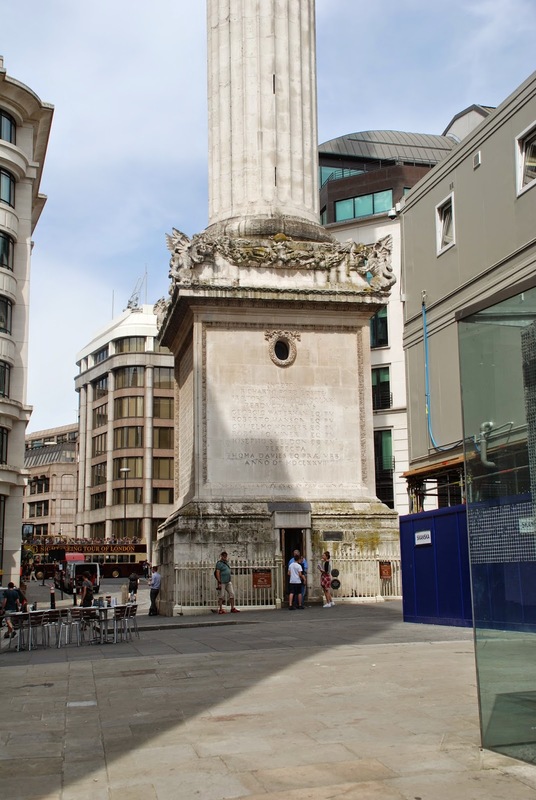 Designed by Sir Christopher Wren to commemorate the Great Fire of London in 1666, the monument sits just a hop, a skip, and a jump away from Pudding Lane where the fire started. It was all the fault of a baker who'd left his oven unattended - well, the baker and the very deficient way in which ye olde London Town had been built with wooden structures and very narrow streets that afforded no firebreaks whatsoever. The fire started on Sunday 2nd September 1666 and was finally extinguished the following Wednesday, 5th September 1666. During the course of those three days it consumed pretty much all of London. Most of the buildings back then were timber constructions that were easily reduced to ashes. The traditionally held view is that there were only 6 verified fatalities of the fire, which seems miraculously low given the geographical scale of the disaster. This thinking has recently been challenged, however, in that the deaths of the middling-classes and the urban poor were not recorded with any accuracy at the time. Moreover the heat of the fire would easily have cremated human remains, leaving no trace of the victim. So perhaps it would be more accurate to say that we just don't know how many people really perished. Anyway, when they finally got the fire extinguished and set about the colossal task of rebuilding the city it was decided that a monument ought to be constructed in memory of the event and to celebrate the rebirth of the city. Sir Christopher Wren was given the job of designing it, and the Monument was constructed in 1671 to 1672. Back then it really stood out. Today, however, it gets rather lost amongst all the office buildings and skyscrapers that are rising thick and fast in this part of town. It's still fun to climb to the top and admire the view. If you're Emi's age (8) they'll even give you a certificate that proclaims your achievement in climbing all of the 311 steps that take you to the top. There's a public viewing platform up there surmounted by a drum and copper urn, which was intended to symbolise the fire. 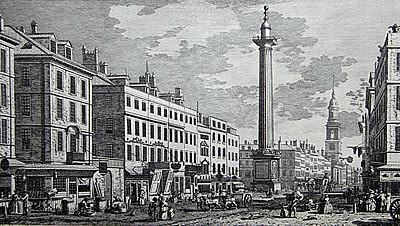 Wren's original intention had been to use the structure for scientific experiments. However vibrations caused by the heavy traffic passing by soon made this impossible. Having gone past the Monument turn left into Pudding Lane, where the errant baker started the Great Fire. 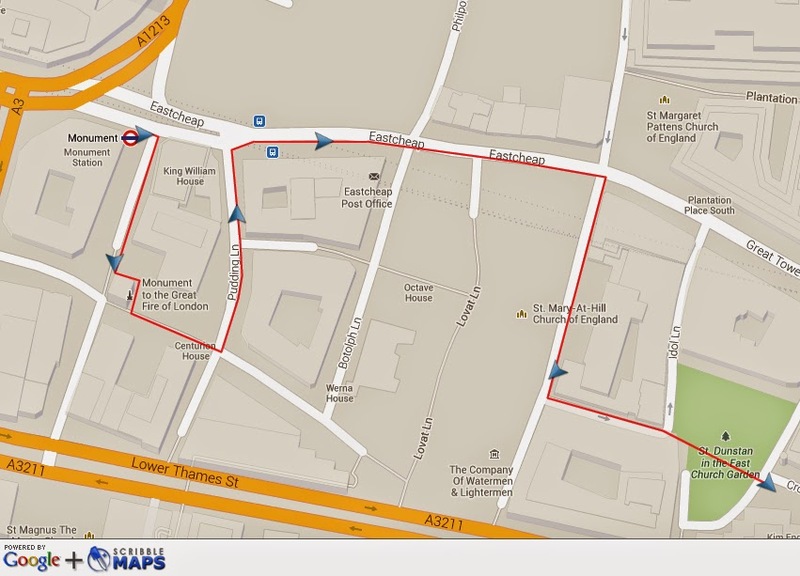 Walk up Pudding Lane, and turn right into Eastcheap. Walk along until you reach St. Mary-at-Hill, and turn right into the little side street of that name. As you walk down this little street you'll see the church after which it takes its name on the right. Now this old church may not look especially impressive from the outside, but they reckon that there's been a church here, dedicated to St. Mary the Virgin, for the better part of a millennium. An already ancient church, is referred to on this site in a legal document dated 1177. Nearby Billingsgate was an important harbour back in the 10th and 11th centuries, and the route north into the old city would have led past the church, making it a significant stop-off point. This street is quite steeply sloped as the land rises from the river, hence the church took its name as St Mary's at the top of the hill. It's humbling to think what this place has lived through; can you imagine the bells here ringing out for the coronation of Henry VIII way back in 1509 or tolling solemnly as the people round about succumbed to the Black Death? The front of the church faces onto Lovat Lane (which you walk past to get to St. Mary-At-Hill). The church of St. Mary-At-Hill was largely destroyed in the Great Fire, but was later rebuilt to the design of Sir Christopher Wren and his assistant, Robert Hooke. It emerged from the Blitz in WWII largely unscathed. Carry on down St. Mary-At-Hill, go past the church, and turn left into St. Dunstan's Lane, at the end of which you will see the church of St. Dunstan in the East, which didn't fare so well in the Blitz. Originally there had been a Saxon Church on this site, which was rebuilt by St Dunstan in 950 AD. This church was largely destroyed in the Great Fire of London, but it was rebuilt by Sir Christopher Wren in 1697. Sadly in 1941 it took a direct hit in the Blitz, which destroyed the greater part of the building. Only the rather fine tower, designed by Wren, survived. They decided not to rebuild the damaged body of the church, but to leave it as a reminder of what had been lost to the bombs. Today it forms a tranquil, charming garden, where office workers come to have a sandwich at lunch time and enjoy a short interlude of peace from the hurly burly of the office. When we did this walk on Monday they were busy installing the ceramic poppies at the Tower for the Blood Swept Lands and Seas of Red art installation. The plan is to continue planting poppies in the moat until Armistice Day, by which time they will have one poppy for each British and Colonial life lost in the conflict (that will be a colossal 888,246 red poppies). It was both moving and spectacular. The moat was filling up with a great red wave of about 120,000 poppies. It looked as though the Tower was haemorrhaging blood into the moat. The Tower is one of our most amazing buildings. There's over a millennium of history just sitting there waiting to be discovered. Speaking for myself I prefer to go there on a wet morning in winter when there aren't quite so many other people around. At this time of the year there's a real risk that you'll get trampled in the stampede, and now that they've done this poppy thing I daresay it's scarily full to overflowing with tourists in there. The poppies are made by hand, and each one is subtly different from the others. We stared at them trying to make sense of the numbers involved, and this was with only a fraction of the poppies installed. But the scale of the sacrifice that was made is hard to get your head around ... .
We carried on walking around the pathway that follows the upper bank of the old (now dry) moat. And marvelled at the artist's vision. Brian Cummins has come up with a great display that's just going to keep getting better and ever more impressive between now and Armistice Day. 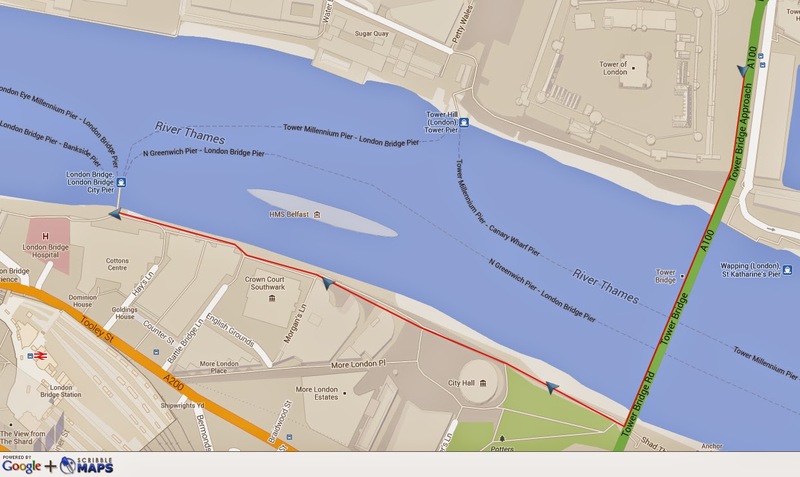 Anyway, here's another map for the next leg of the walk, which takes us across the river. Go up the stairs at the far end of the moat, onto the Tower Bridge Approach. As you can see the poppies were creeping slowly round the Tower. ... and the views of City Hall and the Shard on the South Bank. The very best views of Tower Bridge itself, however, are to be enjoyed once you reach the South Bank. Turn right when you get to the other side, and follow the tow path along the bank of the river. It just keeps looking better and better as you walk away from it. And, looking across the river, you get some pretty fabulous views of the White Tower, the oldest part of the Tower, which was originally built in stone after the Norman fashion to instil fear and awe in the unruly Londoners who were slow to bow the knee to their new French overlords after the Conquest. At that stage the locals only had wooden buildings. Carry on along the path, looking back to see how the changing perspective gives you different views of Tower Bridge. At this angle I can see the Docklands and Canary Wharf through the span of the bridge. OK, I will stop now with all these photos of the bridge. It's going to be difficult, but I don't want to stray across the line and become a bridge-bore. Now, being a girl from Ulster, I always feel a flush of pride when I walk past HMS Belfast. She was built by Harland & Wolff, in Belfast, in 1936 and, after being fitted out and doing her sea trials, she was commissioned by the Royal Navy in 1939 just in time for the commencement of hostilities in WWII. In her day she was the largest battle cruiser in the fleet. They put her into operation as part of the naval blockade of Germany, but she was seriously damaged after only a couple of months of active service when she hit a magnetic mine. It took three years to get her patched up again before she was able to rejoin the war in 1942 and take part in the Arctic convoys that kept the supply lines open to Russia. She participated in the D-Day landings, firing one of the first shots on D-Day itself. So you see she's a huge chunk of history sitting quietly in the shadow of Tower Bridge. If you'd like to visit her you can, and I'd certainly recommend her as a great afternoon-out for 8 year-old boys. Anyway, I think we've now made it onto my fourth and final map. ... and a very humorously decorated telephone exchange box on your left. It points towards the cathedral as though to suggest that its facade is an illusion being projected by the graffiti camera. Go down the steps on your right that take you down to the level of the Cathedral. You are now in the wonderfully named Green Dragon Court. You have the cathedral on your right and just along on your left you have the happy delights of Borough Market. The main market doesn't open for business on Monday and Tuesday, but there are still plenty of lunch stalls that will sell you some very decent tucker. 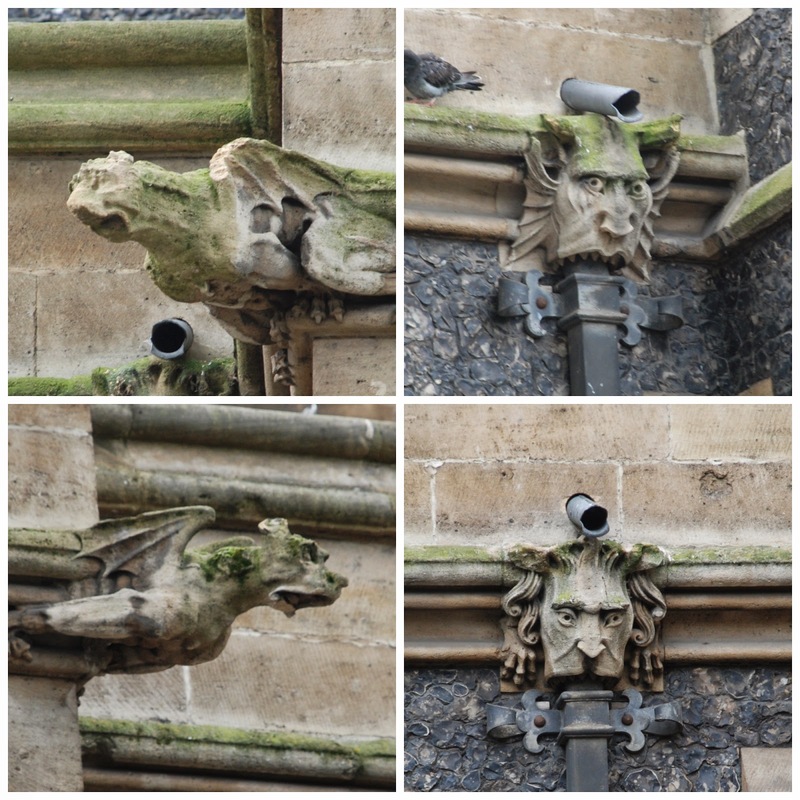 At this point, with child and dog in tow, I dived into the market for some take-away food and drinks, which we then enjoyed as a picnic in the Cathedral yard with the wonderful gargoyles (and an army of office workers) for company. Southwark Cathedral somehow feels rather cosy for a cathedral. And, as with most of the churches in this neck of the woods, it's got a millennium of history to boast about. Carry on round the corner to St. Mary Overie dock and you'll find a replica of Francis Drake's Golden Hinde. I've written about the Golden Hinde II, as she's known here: Golden Hinde II. Carry on around the dock and you'll find Clink Street leading off to your left, and just at the start of Clink Street you'll find the very impressive ruins of the palace of the Bishops of Winchester. 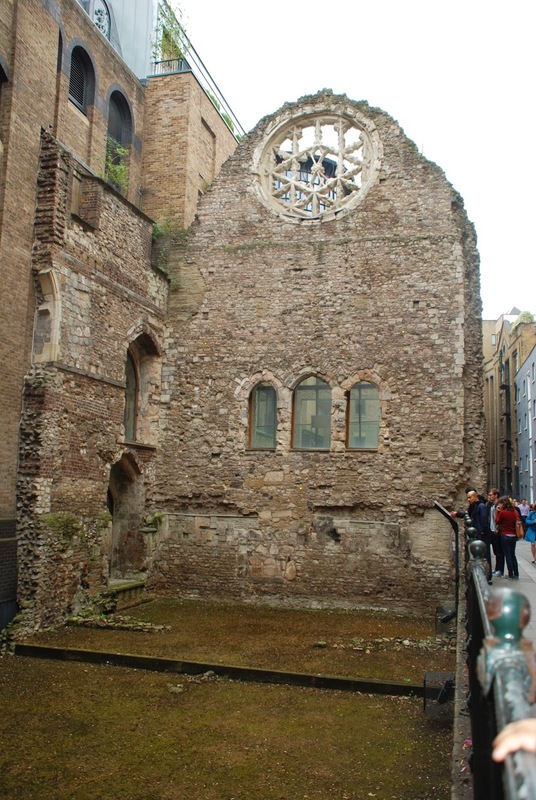 This was once an amazing complex used by the Bishops when they came to London. It was founded by Henry de Blois, the younger brother of King Stephen, back in the twelfth century. The great hall with its beautiful rose window was a spot where Kings were once regally entertained. Back in 1424, for example, it was the very splendid venue for the sumptuous marriage feast of King James I of Scotland and his bride, Joan Beaufort. And if you carry on down Clink Street you'll come to the site of the Clink Prison, which is on your left. You really can't miss it as they've got a dead man hanging in a gibbet outside (eeek!). It's a museum now, which seeks to recreate the authentic Clink experience, boasting that this was the prison from which all others took their name. I've never been brave enough to go down those steps and see what all the fuss is about ... . If you carry on down Clink Street you'll come to Vinopolis, a museum which is all about wine and has some rather impressive graffiti outside. And that's it; that's our walk. 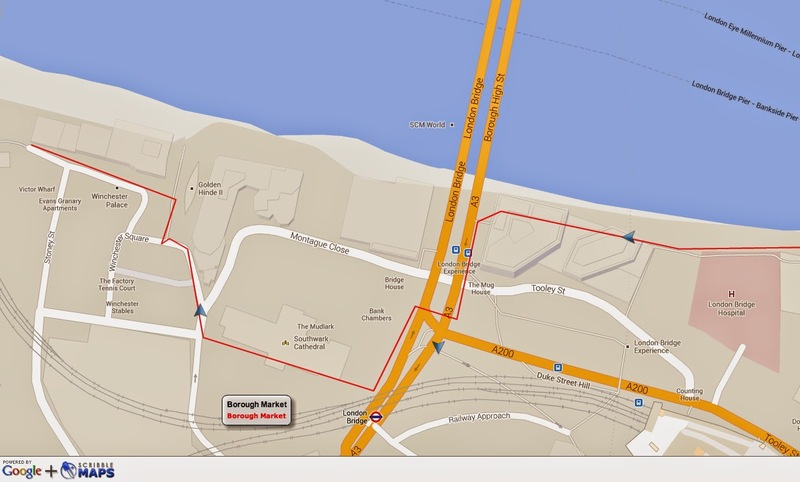 You can retrace your steps to the market, from where you can walk through to Borough High Street and then take the tube home from London Bridge Station. What a fabulous post. It will truly be something when all the poppies have been installed. I had a wonderful visit today and i learned so many things. Have not visited London so this was such a wonderful find today. I would like to visit London! What a great walking tour! I am so envious of all that you got to see and enjoy.. all those poppies were made by hand? Wow, thats amazing. Spectacular tour Bonny! I think they should give the certification to anybody over 40 who can climb 311 stairs. Those red poppies are so amazing, and all handmade WOW! Impressive post. I like the way you documented the entire walk. We had a pied-a-terre in one of the Barbican Towers, and I used to cycle around there many weekends, so it was great to follow your walk. Not Armistice day is upon us, and there is an argu,ment going on to keep this installation intact and not dismantle it, as planned. Thank you. I'm glad you enjoyed the walk.